Germany (Würzburg); Late 15th Century. Latin Text; Angular Gothic Script, Gothic Notation. 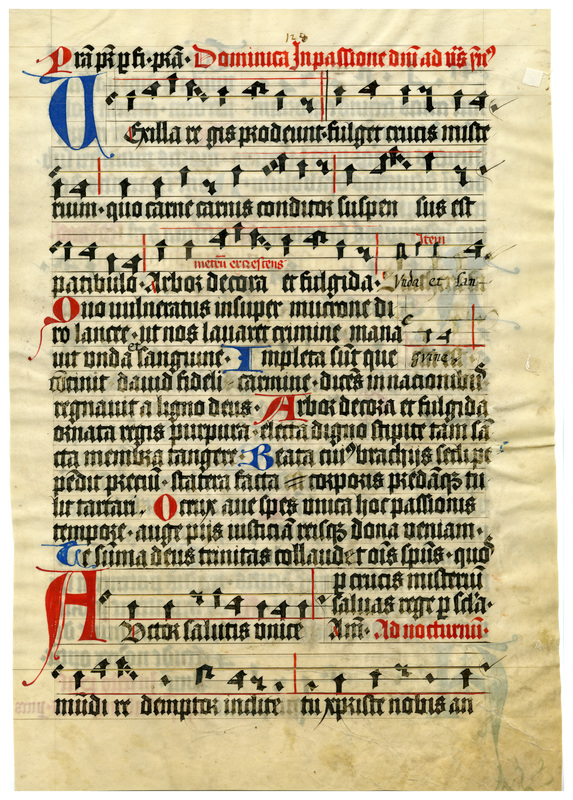 This leaf from the Book of Psalms was written in the Benedictine monastery of St. Stephan in Würzburg and dated 1499 A.D. The book hand closely resembles the fine early gothic types called lettre de forme and used by Fust and Schoeffer in their superb Psalter issued in 1457. It is known that these printers also used this type to print the Canon of the mass which was frequently sold as a replacement for the soiled and worn out manuscript pages of that text. A close examination indicates that the scribe apparently tried to imitate printing type characters in many instances. In just the same way, the first printers had copied in their designs the current local book hand. The line of music giving the "free" melody of the psalm here retains the early XIIth century staff, with the C-line colored yellow and the F-line red. These note forms are frequently called Hufnagelschrift or horse-shoe nail notation because of their resemblance to hobnails. This is the largest leaf in the Ege portfolios, and many of the specimens in the portfolios contain hymn texts. The vellum is thick, but supple through use; the margins are very modest when compared to those of the other leaves in the collection. The ink is black, but faded through exposure in many places. At least one leaf has been repaired and rewritten in a different hand. Most of the red and blue initials, however, have retained their color strongly. Text: This leaf contains text for Passion Sunday, including the famous hymn "Vexilla regis" (Abroad the Regal Banners Fly), written by Venantius Fortunatus in the late 6th century (recto); it also contains the "Hymnus ad matutinam" and the hymn "Rex Christe factor omnium" (Christ, King, You who Made All) (verso). Visit http://www.preces-latinae.org/preces.php for more information about the hymns. 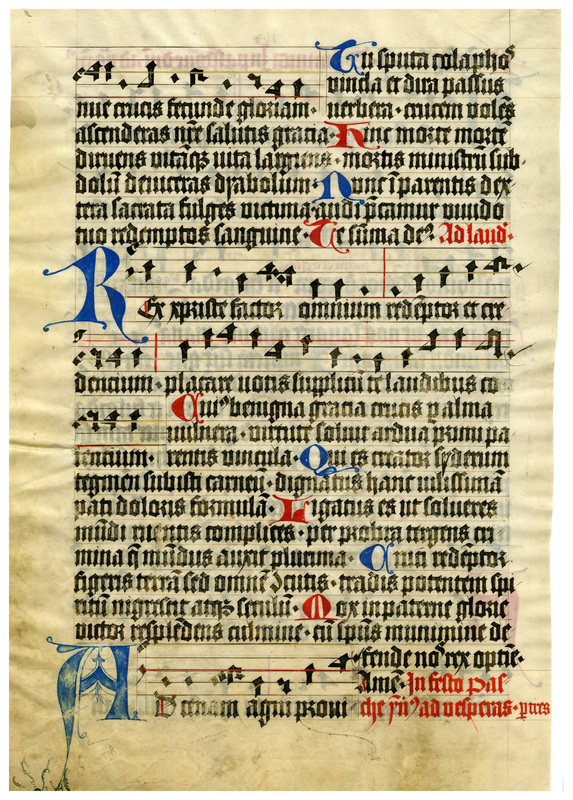 “E0042 Leaf from a Psalter (Psalterium),” Digital Exhibits | Denison University Archives & Special Collections, accessed April 23, 2019, http://exhibits.denisonarchives.org/items/show/62.